My skin's been incredibly dry lately, so I opted to make a super antioxidant rich moisturizing mask for this week's video. If you have dry skin, this mask will instantly add moisture back, in addition to fighting free radicals with tons of vitamin packed honey, matcha and chlorophyll, plus Oleic acid rich Avocado and Olive Oil and anti-inflammatory probiotics. Wear for 15-30 mins. I recommend removing this in the shower. It can get messy. Avocado- High in Oleic acid (65%), it adds hydration and moisture to the skin. This delicious fruit creates an incredibly moisturizing base to any mask. A great use for over ripe or bruised avocados. If your opting to use the oil, just be mindful that it's a three on the comedogenic scale. Probiotics- Packed with billions of active cultures, this good bacteria helps to fight bad acne causing bacteria in the skin. Learn about my love for these little bugs here. Olive Oil- Up to 83% Oleic acid, this squalene rich oil is high in antioxidants while being incredibly nourishing for dry chapped skin. Raw Honey- After lasts weeks post, I'm sure you all started eating and wearing honey daily. Honey is full of vitamins, minerals, and enzymes that are amazing for every skin type. Matcha - A powder made from green tea, this stuff has antioxidants that help fight free radicals, polyphenols that boost your SPF giving you extra sun protection and high concentrations of chlorophyll. It's also a great skin detoxifier. Chlorophyll - chocked full of antioxidants and vitamins, its been proven to fight carcinogens in the body and prevent cancer. It's anti-inflammatory wound healing benefits make it fantastic for healing and fading blemishes. It's rich in magnesium which helps to oxygenate our cells and tissues, in addition to being a a primary component for Vitamin C synthesis. High in vitals A, C, E and K, it's anti aging, helps reduce pigmentation and soothes rough skin. 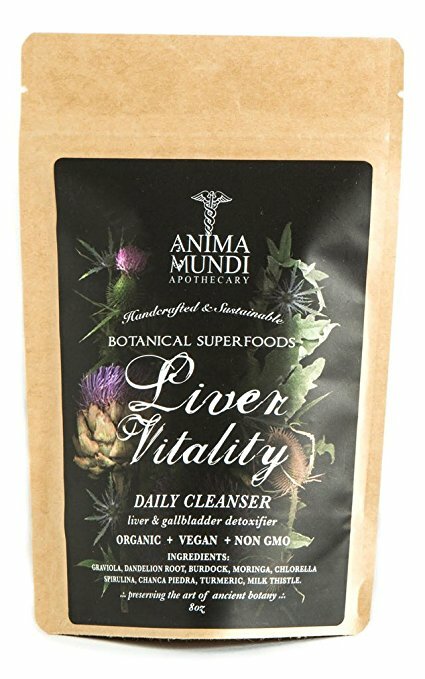 Another of my favorite green masks, utilized Anima Mundi Apothecary's Liver Vitalitypowder. This potent blend of plants and herbs detoxifies not just the liver but the skin. This is one of my favorite powders to use for masks, not to mention my go-to liver cleanser! It's fairly stimulating and leaves your skin glowing! It's full of vitamins, minerals, all of the essential amino acids, antioxidants, chlorophyll and tens of thousands of photo-nutrients making it a powerhouse of skin benefits. If you're only going to purchase one powder add-in, I highly recommend getting these greens! When used topically, they are incredibly stimulating. You will have a flush after removing this mask. Don't be alarmed! That rosy glow is caused by nutrient and oxygen rich blood rushing to the surface of your skin, one of the last organs to receive this nourishment. Within 15-30 minutes, depending on sensitivity, your ruddy flush will fade into the most beautiful glow. Wear for 15-30 mins. I recommend removing this in the shower. It can get messy. Bonus - the powder turns into a facial scrub while you remove it, giving the perfect exfoliation. If you're inspired to make your own DIY Mask, tag me and use #OEdiyMask! You can check out more of my DIY Mask posts on instagram under that hashtag.